Here’s the one thing I know for sure about moving into meditation: The only time you can do it is now. I mean, right now. Even if you haven’t answered your e-mail or paid the IRS or thrown out the three-week-old pasta that’s festering at the back of your fridge or fixed the broken screen door that’s banging in the rising wind of an incoming storm. Even if the person you’re in love with just fell in love with someone else. Even if your kids have commandeered all of your meditation cushions and yoga mats to build an obstacle course in your living room. Glaciers are melting, hurricanes pound one coast while wildfires rage down the other, and you are behind on three deadlines on a job you know you’re lucky to have. People you love have died. And you’re beginning to suspect that someday you might too. So what you are going to do, in the midst of all of this, is stop. Sense the soles of your feet, the tender palms of your hands. Hear the chirping of the wrens or the rumble of the garbage truck. Smell the eucalyptus trees, the cat litter, the antiseptic in the hospital halls, the faint whiff of cinnamon scones wafting from the corner bakery. Gaze up at what you can see of the infinite sky, even if it’s just a chip of blue in the corner of your window—even if you have to close your eyes to imagine it waiting for you, somewhere outside the box of concrete and wood and steel you’re packed inside. Feel your fragile, astonishing human body, your weird and magnificent human life. In the winter of 1999—when I’d been practicing both yoga and Buddhist meditation for about a decade and a half—I started teaching yoga on retreats at Spirit Rock Meditation Center, a Buddhist oasis nestled in the golden, rolling hills north of San Francisco. The retreatants at Spirit Rock had not come there planning to learn yoga postures. (My computer’s spell-checker wants me to call them “retreat ants,” which strikes me as a wonderful metaphor for the diligence with which spiritual seekers tunnel into the depths of their lives while often hauling emotional loads bigger than their own bodies.) They were there to train with a cadre of Buddhist teachers in the art of mindfulness meditation—which, like most people, they generally thought of as something that was practiced while sitting still. Some of them had come because their lives had been shredded—a brain tumor, a shattered marriage, the collapse of a business, the death of a best friend. Others were just looking for a sanctuary from the daily thunder of e-mails and traffic. When I first started teaching there, I was newly married and grieving a daughter who had died at birth. Over the coming years, I taught on retreats while pregnant, while nursing a baby, while divorcing, while raising a son. In a sheltered valley shared with bobcats, deer, turkeys, lizards, and the occasional mountain lion, we would sit for hours in silence while winter rains drummed on the soaring roof of the meditation hall. We’d do walking meditation on paths winding through spring irises or sun-scorched summer hills—then pick ticks off our pant legs before returning to sit again. In those days, yoga was not permitted in the main meditation hall—one meditation teacher joked that the Buddha seated cross-legged on the altar might be offended by the sight of so many buttocks uplifted in Downward Dog. The retreatants were more likely to be wearing baggy jeans or peasant skirts than stretchy leggings. So every day we went to a small upstairs room where I taught gentle but powerful movement, breath, and energy practices from the hatha yoga tradition. These brought relief to backs, necks, and shoulders knotted by hours of seated meditation. But more important, meditators reported that the yoga opened up a new way of connecting with the practice of mindful presence—and helped them embody their meditative awakenings as they moved back into the chaos and beauty of their daily lives. And although I was there in the role of a teacher, what I mainly noticed was how much I was learning from the retreatants—their courage and vulnerability as they turned to face themselves again and again. What kind of practices should I offer people who came to the yoga sessions so sensitive and open, as if, in the shrine of silence, they’d removed the protective armor around their hearts? The writer Annie Dillard tells her students, “Write as if you are dying; or as if you are writing for an audience consisting solely of dying people. That is, after all, the case.” How could I teach with that kind of depth? Based on these explorations, in 2006 I began to codirect (with the Spirit Rock Guiding Teacher, Phillip Moffitt) an eighteen-month program training yoga teachers to integrate mindfulness meditation into their practice. Unlike most meditators, the yoga teachers arrived at Spirit Rock wearing workout clothes and carrying rolled-up mats, foam blocks, and an arsenal of straps, bolsters, blankets, and eye pillows. But like anyone else, they were also carrying their lives, a bubbling stew of heartbreak and happiness. A mother was grieving two children killed in a fire. One couple got pregnant during the training and brought their nursing baby to the final ten-day retreat. Between sessions, gang violence left the home of a young woman trainee riddled with bullets. Over the course of the training, they brought into their practice of yoga postures and breathing techniques the practices of meditation and heart-mind training that have always been part of the true yogi’s path. And they explored the questions that yogis have been asking for centuries: How do we live with wisdom and compassion in these human bodies, these human hearts, these human minds and spirits? How do we find deep joy and meaning in a world where everything dear to us will eventually slip from our grasp? These are the questions that Moving into Meditation intends to explore. 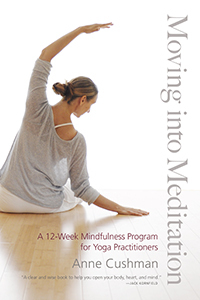 It’s a systematic program designed for yoga practitioners of all levels who want to deepen their practice of physical postures and breathing techniques to support, express, and include the ancient art of mindfulness meditation. It’s for people who want to attend not just to the body but also to the heart and mind, intentionally cultivating kind, moment-to-moment presence for every experience, from frying an egg or writing an e-mail to dancing at a wedding or sitting by the bedside of a dying friend. - You’ll learn how to practice yoga postures as meditation in motion, inviting you into a deeper intimacy with your body, breath, heart, and mind. - You’ll nourish your inner peace and stability through connecting with and freeing your breath. - You’ll cultivate a daily home practice of seated meditation that’s solidly grounded in your felt sense of your body. - And you’ll progressively develop the ability to know more deeply and relate more wisely to every part of your inner and outer life—the sensations of body and breath, the ebb and flow of emotions, the twitter of thoughts, the unpredictable and ever-changing circumstances in which you find yourself. Almost everywhere these days, you can find excellent yoga classes where you can learn the basics of yoga alignment and be guided through a sequence of postures that will improve your strength and flexibility, reduce your stress, and increase your joy. But the vast majority of classes include little or no instruction in the art of seated meditation, even though meditation is fundamental to the classical yoga tradition. You can also find many wonderful courses and retreats where you can learn the practice of mindfulness meditation. However, most of those offerings do not explicitly build on the skill and sensitivity to body, breath, and energy that you are developing in your yoga practice. This program is your chance to explore and integrate yoga and mindfulness meditation in a unified way, within the cauldron of your own individualized home practice. It’s not an instruction manual of yoga postures (of which there are many excellent ones available)—in fact, the program assumes that you are already familiar with the yoga basics. Rather, it’s designed to help you learn how to use these physical forms as a vehicle for becoming more intimate with yourself and your world. Rather than specific asanas, it teaches ways of paying attention that can illuminate and transform your practice whether you’re a relative beginner or a seasoned practitioner. You’ll use the forms of asana, pranayama (breath cultivation), and meditation to progressively deepen your connection with and understanding of your body, heart, and mind—not the perfect body, heart, and mind that you might achieve sometime in the distant future through a raw vegan diet, daily workouts, and decades of psychotherapy but the flawed and miraculous ones you already inhabit. The forms of yoga will become a gateway to the practice of fundamental principles that can help you live a sensitive, responsive, and embodied life.